The KAP Foil 5.0 is more than sufficient to carry heavier cameras in light winds. In stronger winds, these kites fly very stable without slipping sideways. Width: 240 cm / 94"
Height: 200 cm / 79"
Line rec. : Polyester 150 kg / 330 lb. 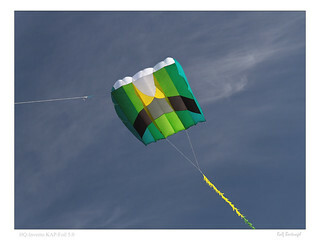 The HQ KAP Foils are very reliable and stable kites. They are heavy pullers, and are preferably flown from an anchor point. I'm using the 5 and 8 m2 models. KAPshops 150 kg. Dacron line goes excellent with them. I only fly them with full line fuzzy tails. Flying these kites is a bit of a learning curve, but you will get used to the size and pull. Flying a KAP Foil requires some climbing stuff to make your life easier. They can lift big cameras and are a joy to fly. The quality of the kites is really good. Highly recommended. Regards, Bas..